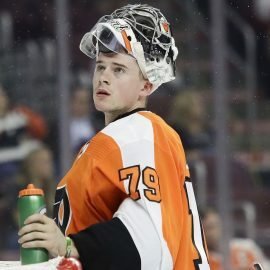 Carter Hart seems almost too good to be true. He looks destined to be the Flyers’ best goalie in three decades. Combine that with his boyish enthusiasm and genuineness and you can understand why he has quickly become the fans’ most popular player. When they announced the starting lineups for Monday’s game against Vancouver at the Wells Fargo Center, there was a loud roar from the fans for Flyers captain Claude Giroux, a likely Hockey Hall of Famer some day. One player got a louder roar: the Whiz Kid Goalie who is the only Flyer to ever wear No. 79. Hart selected that number because he didn’t want to disappoint an autistic boy named Connor Parkilla, who devotedly watched the goaltender’s home games when he played in the Western Hockey League for the Everett (Wash.) Silvertips. In 2016, Hart had just gone back to Everett from the Flyers’ development camp in Voorhees. He wore No. 79 at camp, but he would get a lower number, he figured, when he eventually made the Flyers. But his plans changed — and his heart melted — when he saw Connor at a Silvertips home game wearing a No. 79 Flyers jersey with Hart’s name on the back of it. Which is why Hart, who has taken the league by storm and become a rookie-of-the-year contender even though he has been with the Flyers less than two months, decided to keep the number when he reached the NHL. Hart and the little boy will soon be reunited. The goalie has arranged for Connor and his parents to be his guests at home games Feb. 16 against Detroit and Feb. 19 against Tampa Bay. It’s easy for professional athletes to get jaded by the fame and the fortune. There seems little danger of that happening with the oh-so-grounded Hart, who went out of his way to spend extra time with blind students and a man battling ALS as they visited the Flyers’ practice facility this past week. With Saturday’s 6-2 win over Anaheim, Hart is on a personal eight-game winning streak. During that span, he has a 2.35 goals-against average and .934 save percentage. But don’t think for one minute Hart would have been this dominating if he didn’t get his feet wet in the AHL, where he struggled mightily at the start of this season. After a strong training camp with the Flyers this season, Hart was disappointed he was sent to the Phantoms. “I went down there and just made the most of every opportunity,” he said. Now he’s here for the long haul, exhilarated by a No. 79 jersey that gives him inspiration every time he puts it on.